Stock #S501L:HUGE!!! 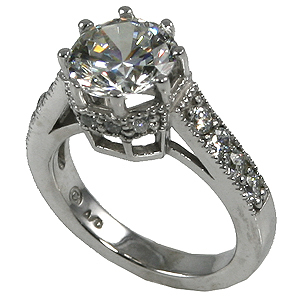 Platinum Antique Style Fancy Ring... 3 Carat/9mm center w/8-.15 ct accent stones down sides and 8 .02 carat accent stones around the head... Gorgeous Top quality Russian CZs. Immaculate Top-quality workmanship, Heavy, antique style engraved shank. Large, Flashy ring!! !